Motors at a Mid-West Papermill must be equipped with AEGIS® Bearing Protection Rings to divert damaging currents to ground. drive (VFD) must be tested, and if shaft voltages are found the motor must be equipped with an AEGIS® Bearing Protection Ring to divert damaging currents to ground. The plant’s electrical reliability engineer established this money-saving specification after many years of frustration from recurring bearing failures. The maintenance history of one motor tells the story. The large 1,000 HP motor is part of a system that turns pulp into “parent rolls,” which are later cut into well-known brands of paper towels, napkins, and other products. The mill, one of many owned by a major paper company, employs more than 1,800 people in collecting and converting about 430,000 tons of wastepaper per year. The problem with the motor, which runs at up to 1,200 rpm, stemmed from its VFD, which induces stray currents that travel through the motor’s shaft. Pitting of a bearing race wall (magnified) — the result of electrical discharges from the motor shaft. Despite the efforts of the plant’s in-house maintenance staff and the plant’s maintenance contractor, L&S Electric Inc., the shaft currents would destroy the motor’s bearings within two years. Seeking ground, the currents blasted the bearing balls and races with countless fusion craters. The arcing that created these pits released tiny particles of metal that contaminated bearing grease, causing friction and high temperatures that burned the grease. Following the industry-standard routine of the time, L&S Electric would take the motor to their shop for reconditioning, which included disassembling it; cleaning, testing, and replacing both bearings; reassembling and transporting it back to the mill; and reinstalling it. Over the years, L&S tried insulating the opposite-drive-end bearing and installing carbon-block grounding brushes inside the drive-end bearing cap. But the problem just moved to the drive-end bearing. Each reconditioning took a chunk out of the maintenance budget — $8,000 to $10,000, not counting the cost of bringing the motor’s production line to a halt. When L&S took the motor to their shop for yet another reconditioning in June of 2009, the reliability engineer decided to try something new. L&S added an insulated bearing housing to the motor’s drive end and, at the engineer’s request, installed an AEGIS®SGR shaft grounding ring, manufactured by Electro Static Technology (EST). The ring channels harmful currents away from bearings to ground. But hopes were dashed just three months later, when an on-site oscilloscope reading indicated the voltage was still high enough to damage the bearings — over 5 volts. When the bearings were replaced again, L&S added two copper-bristle grounding brushes on opposite sides of the drive-end shaft. The regional EST sales representative suggested the mill try another type of AEGIS® ring — the iPRO. Specially designed for high-current applications, the iPRO is ideal for protecting medium-voltage motors, generators, and turbines against electrical bearing damage. The AEGIS®SGR had been too small to divert all the current from the shaft of such a big motor,the sales rep explained. He offered an iPRO ring free of charge. In May of 2011, L&S installed the iPRO on the motor in place at the mill. The split-ring iPRO fit around the motor shaft, eliminating the need to decouple attached equipment. Two and a half years later, the motor was still running smoothly — the longest stretch ever without a bearing replacement. 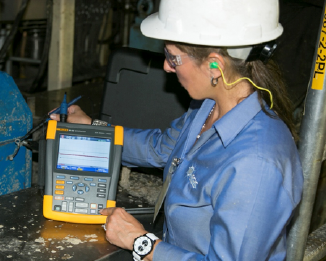 A “pigtail” lead installed by L&S allows the reliability engineer to check the shaft voltage easily and safely, which he does regularly with a portable oscilloscope. He reports that the readings have stayed under 5 volts. In addition to checking the motor’s shaft voltage, the manufacturer of the iPRO ring recommended periodic inspections be done to ensure the motor shaft remained conductive in this harsh environment. After the first six months of operation, the split-ring iPRO was removed and the motor shaft was cleaned to remove any corrosion or oxidation, and recoated with colloidal silverto ensure high conductivity. 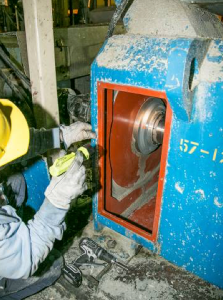 This routine shaft maintenance is now scheduled to coincide with regularly scheduled plant maintenance shutdowns and has enhanced the effectiveness of the AEGIS® iPRO ring. “I’m really ecstatic over the results,” comments the reliability engineer, who has since had AEGIS® rings installed on several of the plant’s other motors. 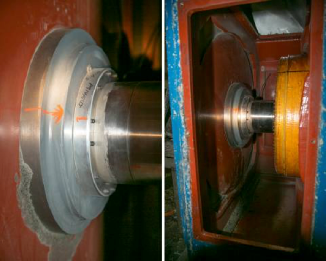 Close-ups of the AEGIS® iPRO Bearing Protection Ring on a key motor in a Midwest paper mill. Prior to installation, the section of the motor shaft that would be contacted by the grounding ring’s microfibers was thoroughly cleaned and coated with colloidal silver to enhance conductivity and retard corrosion. The maintenance-free AEGIS® iPRO grounding ring is available in a range of sizes to accommodate generator/motor shafts up to 30” in diameter. Embedded securely in the AEGIS® FiberLock channel along the inner circumference of the ring, six rows of conductive microfibers completely surround the motor shaft, providing millions of discharge points for harmful shaft currents and effectively diverting these currents to ground. The iPRO works even in the presence of contaminants, such as the paper dust in the air at the mill. As part of a preventive maintenance program, it can be installed on in-service motors or whenever bearings are replaced. Because VFDs can save 30% or more in energy costs, they have been cited as a key technology for those wishing to make their commercial HVAC systems, automated assembly lines, and other processes more energy-efficient (“green”). But, whether used to control a motor’s speed or torque, these drives often induce voltages that can damage bearings. In fact, the costly repair or replacement of failed motor bearings can wipe out any savings a VFD yields and severely diminish the reliability of an entire system. It is now widely understood that the high switching frequencies of today’s VFDs produce parasitic capacitance between a motor’s stator and rotor. Once the resulting voltage pulses reach a level sufficient to overcome the dielectric properties of the bearing grease, they discharge rapidly and repeatedly along the path of least resistance between shaft and frame — typically through the bearings. 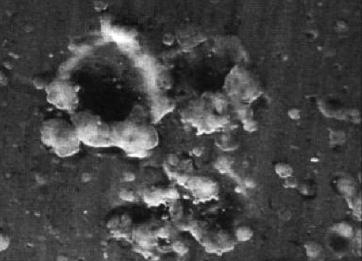 Without mitigation, these discharges can be so frequent that — through the process of electrical discharge machining — they create millions of fusion craters. Before long, the entire bearing race can become eroded with countless pits known as frosting. Cumulative degradation known as fluting can also occur, shaping the frosting into washboard-like ridges across the bearing race and causing noise, vibration, increased friction, and bearing failure. This is what happened to the paper mill’s motor, over and over again until the AEGIS® iPRO solved the problem. Once the AEGIS® iPRO Bearing Protection Ring had been installed and the motor restarted, an AEGIS® technician confirmed that motor shaft voltages were minimal using an oscilloscope. A special “pigtail” lead allows maintenance personnel to periodically check the voltages (and therefore the likely condition of the bearings) safely and easily, without exposing the shaft. The ring has been diverting potentially damaging voltages to ground since it was installed. Unlike conventional single-point-contact brushes, the AEGIS® grounding ring’s conductive microfibers line its entire inner circumference, encircling the motor shaft with contact points for far greater effectiveness. This design boosts the ring’s electron transfer rate, providing very low impedance from shaft to frame, bypassing the motor bearings entirely, and bleeding off damaging currents safely to ground. Because the ring’s conductive microfibers work with little or no physical contact, they do not need the regular maintenance/replacement that metal or carbon-block grounding brushes require. Patented Nanogap Technology maintains electrical contact between the microfibers and the motor shaft, thus diverting harmful shaft voltages whether or not the microfibers are touching the shaft. This ensures that the ring will last the life of the motor regardless of motor speed, and will work effectively even in the presence of dirt, grease, or other contaminants.